Our bedrooms are a hub of our favourite belongings, including clothes, jewellery, accessories, books, collectables, and more. While designing custom closets in Toronto can help organize and store your belongings, you can also put your items on display with custom wall units. Wall units can be built around your headboard to frame your bed and become a focal point inside the room. They can also be installed along the walls to create custom shelving for books, jewellery boxes, and framed photos. Getting ready in the morning will be a breeze when the items you need are efficiently stored in wall units, shelving, and closets built specifically for your needs. Custom wall units are a wonderful addition to master bathrooms to store towels, bath and skincare products, and other toiletries. Shelving units can be built in a floor-to-ceiling style to maximize your storage space, or installed on the top half of the wall to make room for a hamper or towel rack underneath. And if you like to read in the bath, you can use your wall units to store books and magazines, so you can easily relax in a bubble bath with a good book. There never seems to be enough storage in the kitchen! If your prized cookbooks and spice racks are currently stashed in a corner, why not put them on display with custom wall units? Wall units can be built to fit pots and pans, canned and jarred goods, baking products, cookbooks, and more. You’ll love cooking in a luxurious, well-organized kitchen where everything you need to create a delicious meal is close at-hand. Everyone gathers in the living room to talk, watch television, and play games, and in result, they can become quickly disorganized. Custom shelving in Toronto and custom wall units can help keep your living room clean and tidy for your family and guests. A wall unit can be built around your television to create an attractive entertainment centre that stores DVDs, video games, board games, and more. Wall units can also be installed along the side walls to create shelving for books, photos, and collectables you want to showcase. Custom wall units add organization, luxury, and value to every room in your home. The advantages of are infinite! 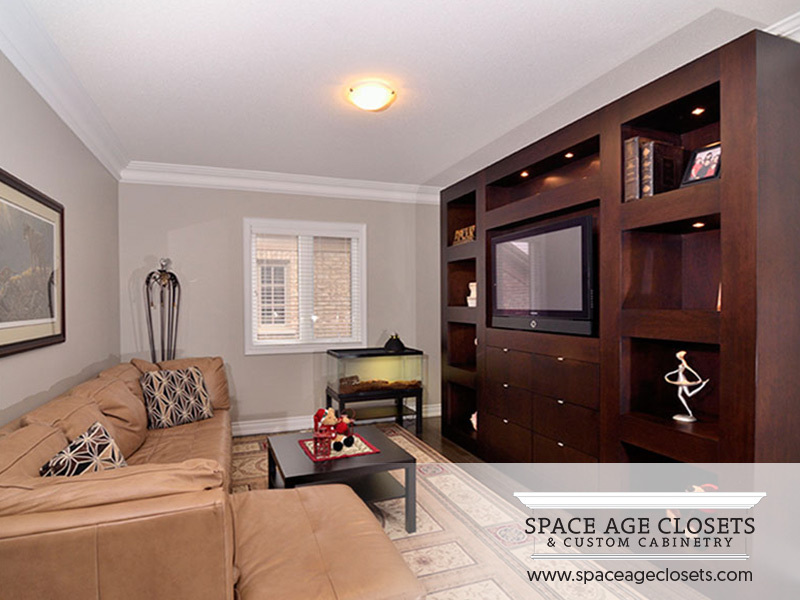 Whether you want custom wall units, custom shelving, or custom closets in Toronto, the experts at Space Age Closets & Custom Cabinetry can help. We design, build, and install high-quality custom storage and closets for clients in Toronto and the surrounding areas. Contact us to learn more and to book a complimentary consultation.